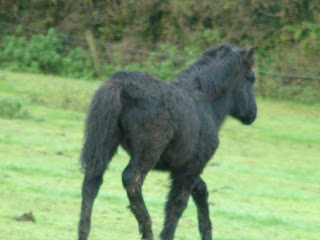 Dartmoor Pony Training Centre - Re-homing Blog: Thanks to Face Book he has a home hooray! Thanks to Face Book he has a home hooray! Well as always tends to happen one of the people who was taking a rescue foal has sadly backed out at the last minute and we have one lonely little black colt who we desperately need to find a home for. As you can see he was a little camera shy! The vet is due out on Wednesday to microchip and passport the herd and the rest of the ponies will all have been collected by Sunday the 22nd. It would be terrible for this little chap to be left behind alone, or even worse to have to be shot.